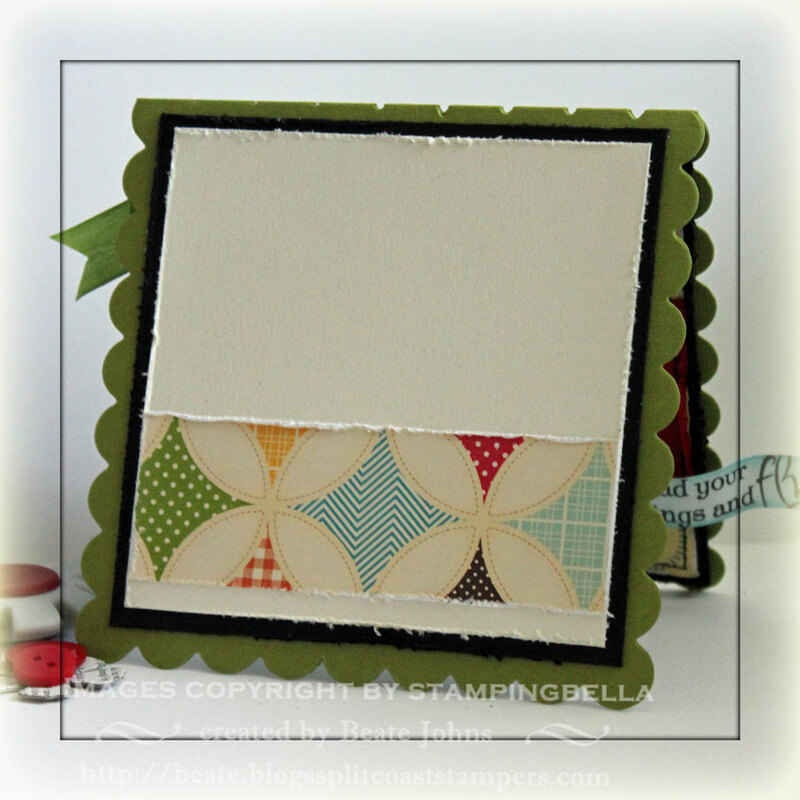 All my playing with MFT stamps got me hooked on cute images. I usually don’t think I am any good at cute cards, but they are so much fun! So I stamped Maisy Ketto with Tuxedo Black Memento Ink on Solar White Neenah Cardstock and colored her with Copic Markers ( C1, YR000, YR00, Y35, Y38, R27, R29, BG000, E19, E25, YG17, YG25). Originally I had tried to turn this into a magic card, but I didn’t like the way it looked, so I finished the card for Thursday’s Way to Use it Challenge. The card base was cut out of Old Olive Textured Cardstock with Stampin’ Up!’s Big Shot Scalloped Square die. The edges of a 3 7/8″ square of October Afternoon Fly A Kite Paper were distressed. A 1 3/4″ wide strip of textured Real Red cardstock was adhered to square before it was stitched to a 4 1/8″ square of Basic Black cardstock. A Scallop Square Frame was cut with Square Nestabilities. The edges of the image layer were sponged with Tumbled Glass Distress Ink and paper pierced before the frame was adhered. Stardust and Orange Stickles were added to the image and Tiny Twinkles adhered to ther crown. A bow made out of 1/2″ wide olive Silk Ribbon was adhered to the top left of the frame with a red button on top. I don’t have any Bella sentiments yet, so I used one from Verve’s Beautiful Kindness. It was stamped on a 1/2″ wide strip of Solar White cardstock with Tuxedo Black Memento Ink. the edges were sponged with Tumbled Glass and the left edge was punched with my Photo Corner Punch (SU). It was attached to the lower right side of the frame. The flower was cut out of a Grunge Paper, that was covered with dictionary pages. The flower was colored with the yellow Copics I had used on the image. A red button was attached to the flower center with black waxed Linen thread. The inside was decorated pretty simple. I just can’t leave card insides completely blank anymore. It seems unfinished. This is so darling Beate!!! I love how you’ve colored this sweet image, all the scallops and the details are perfect! Your card totally makes me want to buy this image. Eine wunderbare Karte liebe Beate, und ich bin total begeistert von den schönen Farben und Deiner Perfektion. This is so adorable Beate!! Lovely scalloped base, wonderful colors and such a cute image!! You ROCK at cute cards, Beate! OMG, how cute! I love that you mixed cute with grunge! Perfection, my friend – Thanks for sharing! Not good at cute cards… get out! This is fabulous! I’d call it elegant cuteness! ahhhhhhhh you do cute VERY well girl! Love this! !